Dept. 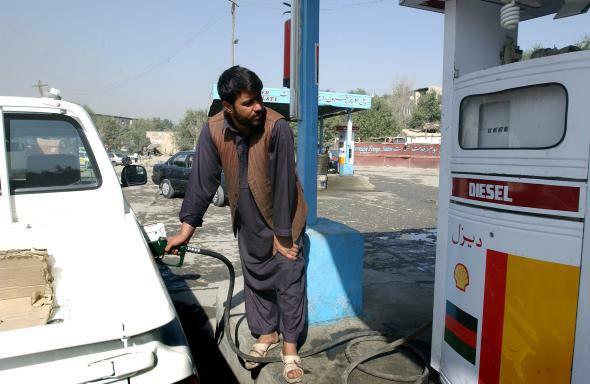 of Defense spent $43 million on Afghan gas station, SIGAR reports. An gas station employee fills the tank of a car in Kabul in August 2005. The U.S. Department of Defense spent some $43 million on a single gas station—in Afghanistan. This wee example of questionable financial decision-making comes via an audit released Monday from the Special Inspector General for Afghanistan Reconstruction (SIGAR). To make matters worse, gas stations aren’t supposed to cost $43 million to build and a similar compressed natural gas (CNG) station in neighboring Pakistan cost only about $500,000 to get up and running. Budgeting and oversight may not be the DOD’s strong suit. “The DOD charged the American taxpayer $43 million for what is likely the world’s most expensive gas station,” Special Inspector General for Afghanistan Reconstruction John Sopko said Monday. “DOD spent $43 million on the gas station, without determining it would be a good idea, and now claims it knows nothing about the project.” Oof. The gas station in the city of Sheberghan, 300 or so miles northwest of Kabul, was part of a pilot program of sorts to prove the commercial viability of CNG as fuel for automobiles as part of a larger push to reduce Afghanistan’s reliance on imported petroleum in favor of its domestic natural gas reserves. According to the report, the DOD didn’t make much of an effort to assess whether switching over to CNG was at all practical or cost effective. For instance, to be able to use the CNG in their cars it would have cost Afghans some $700—more than the average yearly salary of locals—to convert a vehicle to run on CNG. That was just one of the infrastructural obstacles, according to the report. Even still, in 2011 a company called Central Asian Engineering was awarded the contract to build the station and over the next three-plus years that price tag ballooned into the tens of millions. “There may be fraud. There may be corruption. But I cannot currently find out more about this because of the lack of cooperation,” Sopko told NBC News. “According to SIGAR, DOD said the group in charge of the project, the Task Force for Business and Stability Operations (TFBSO), had been closed in March 2015 and therefore the DOD ‘no longer possess[es] the personnel expertise to address these questions…’” ABC News notes.